A spare clear g40 bulb for when and if you will need a replacement. Max connecting 2 stands together). 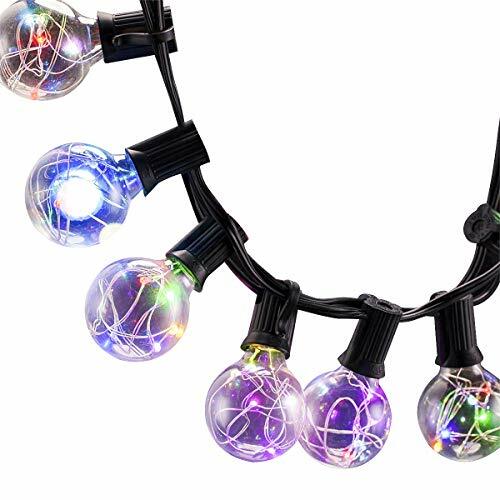 Each bulbs with a small clip on the light socket, fix the globe string light easily. IP44 grade appeal to different application: garden, lawn, party, patio, wedding and Christmas. 1.The product was fulfilled by Amazon; you can get your parcel faster. 2.Get solutions from the seller in 24 hours if you have any questions about the product. 3.Product enjoys 365 days quality warranty, except artificial damage. 34ft long with 30 light bulbs, end to end connectable. IP44 is more suitable for indoor and outdoor use. UL certification: UL588 approved for safer usage. UL certification: UL588 certification can be used more safely. High-security power adapter with short-circuit protection for better protection of you and the starry string lights. Energy saving: only 7.9KWh electrical bills a year if turn it on 6hours everyday, save 450KWh than Tungsten bulbs. Broad application: Great for bistro gazebo deck, yard, Cafe Gazebo Porch, Weddings, Garden, Tents, Gatherings, BBQ, City Rooftops, patio umbrella, Dinner Parties and Birthday Parties. Quality warranty: the product enjoyed 1 year quality warranty and 60 days money back guarantee. If you have any questions about this product by ECOWHO, contact us by completing and submitting the form below. If you are looking for a specif part number, please include it with your message.